This part of the narrative won’t be broken down so much into days, since I was staying in the same place the whole time. I’ve always enjoyed arriving at a place I’ve never been before at night. I love forming an idea of it when I can’t really see it, and then seeing it in daylight and trying to work out where everything was the night before. Annecy is a beautiful place. There’s water everywhere, in rivers, in fountains, in the all consuming lake, and it’s all crystal clear. It was a wonderful place to arrive after a long journey. 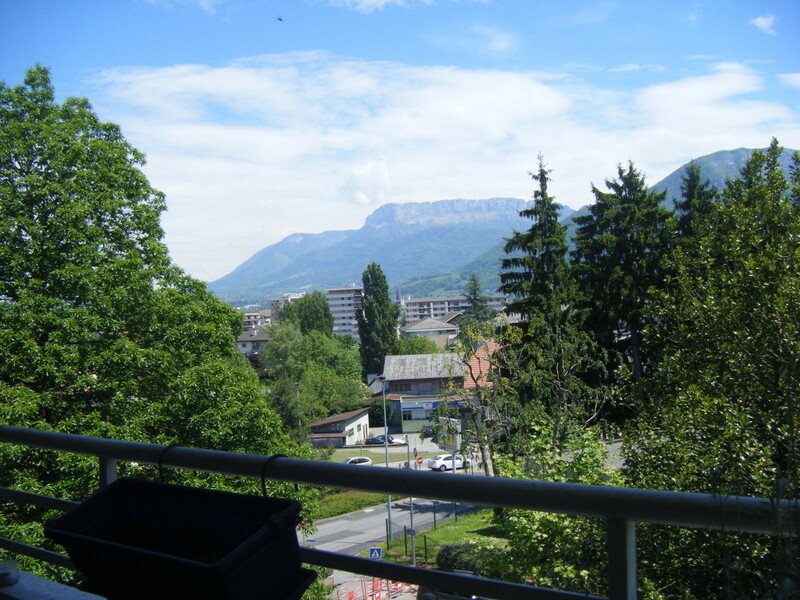 Zoe took me to her apartment, which is on a hill overlooking Annecy proper, and we talked for a bit. That night, I had my first shower in 4 days, slept on a sofabed under an actual ceiling and did not wake up at 7am with my bedding covered in a mix of dew and condensation. It was awesome. We had breakfast, again on the balcony, and talked more. Something I’ve found since I began hitching is that it’s allowing me to establish relationships with parts of my family, beyond the “see you next time someone gets married or dies!” kind. None of my extended family lives in Cornwall, so growing up I would see relatives maybe once or twice a year. I figured that, at 26, if I wanted to have a relationship with my relatives, it was up to me, rather than to some other family member to set up some big get together. This was a theme even before Annecy, since as a warm up for this trip I hitched up to Bristol to visit Rhiannon, and Merion, my cousins from the other side of my family; while growing up so far away from everyone wasn’t great, it’s now a huge advantage to have so many floors I can sleep on dotted about the place, and a real pleasure to get to know the rest of my generation on equal terms, rather than the slightly contrived conversation of family gatherings. The view from Zoe’s balcony. Zoe is also self employed, rather more successfully than me, so I left her working and headed out to explore the old town and maybe go for a swim. I’d been given directions, but the old town proved surprisingly hard to find. I asked someone, was pointed back the way I’d come, and was wandering vaguely along when I saw a café Zoe had mentioned. 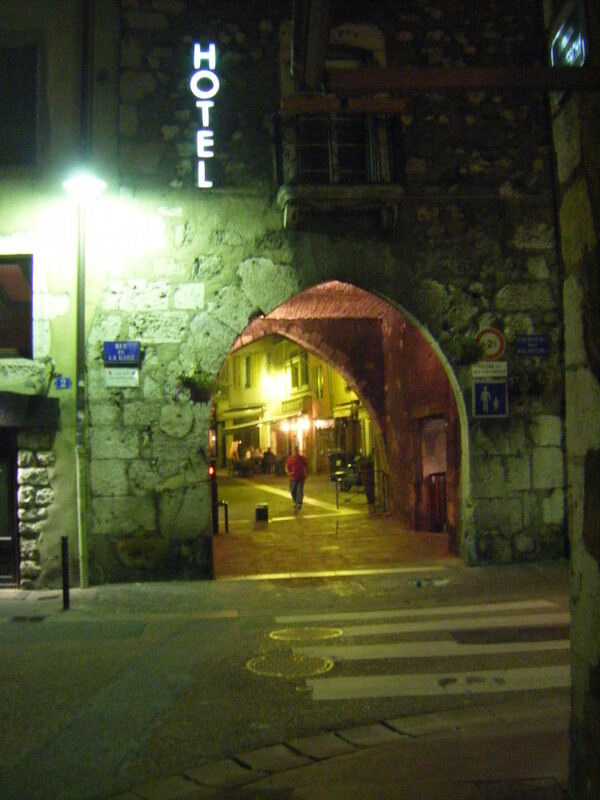 Next to it was an archway, unremarkable in many ways, but on one side was a fairly typical inustrialish French town, and on the other, the breathtaking old town. It was a bit like the entrance to Diagon Alley. The magical archway. This was taken later, since, not realising its magical effects, I didn’t take a picture on the first day. The old town is absolutely beautiful. Very alpine in its architecture, yet interlaced with watercourses. Beautifully crumbly buildings overhanging rivers with mountain views have lead people to call it the Venice of the Alps, or, the Venice of Not Actually That Far North-West of Venice. Zoe has been working on a theory that everywhere is the Venice of somewhere. 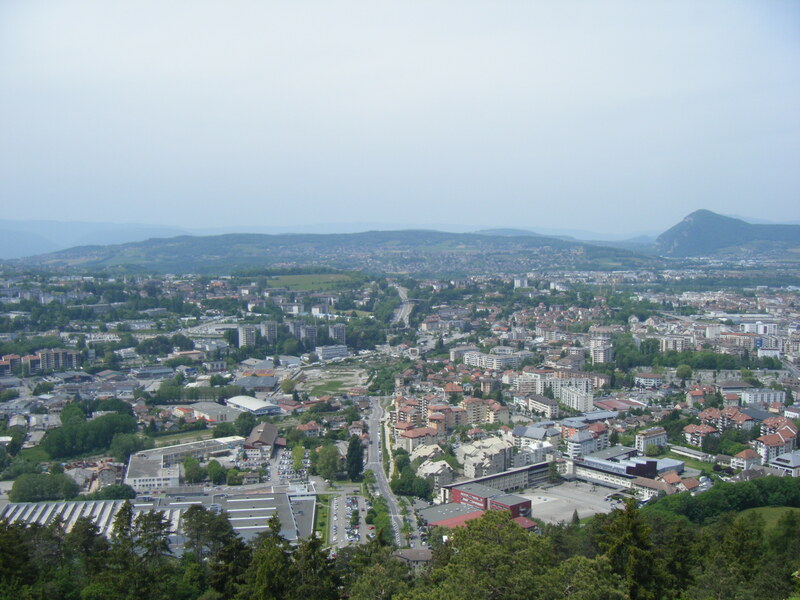 Most of Annecy looks more or less like this. 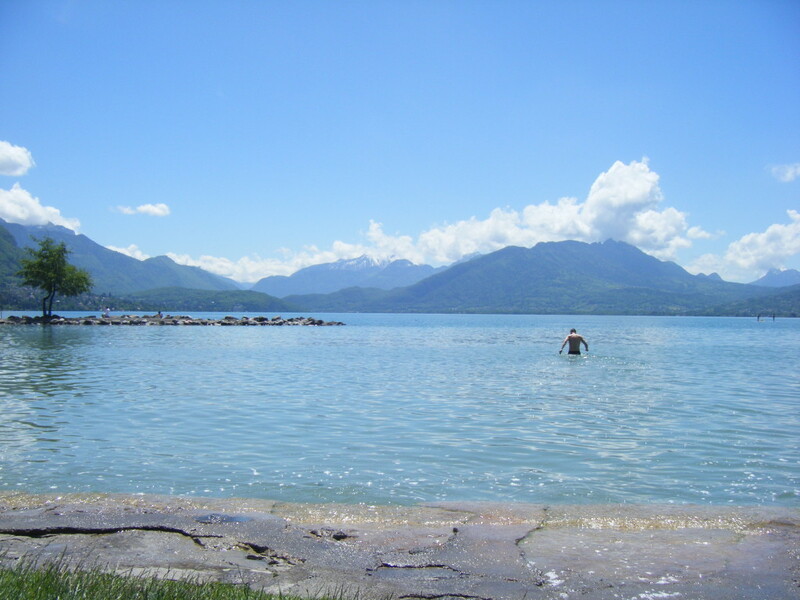 I made it to the lake and went for a swim, in the shadow of the mountains. The water was the clearest I’ve ever swum in, and was somewhere between 14 and 17 degrees, which was just about perfect for me. I was able to swim for about 20 minutes at a time, then get off and drip dry in the sun without shivering. Anyone who knows about me and wild swimming will know that while I do often swim in cold water, I actually have very little tolerance for the cold, so it was profoundly strange to see a few of the apparently hardier locals swimming in wetsuits, gloves, boots, and neoprene balaclavas. Here is a picture of a swan. At this point, I feel the need to mention my Onya bag. Knowing I’d be stopping along the way, leaving my rucksack, and exploring on foot, I’d thought about bringing a smaller rucksack as well, but I didn’t have the space. I threw my Onya bag in, which packs down to slightly smaller than my fist, then folds out to perfect daysack size. Also, it’s made from recycled bottles. 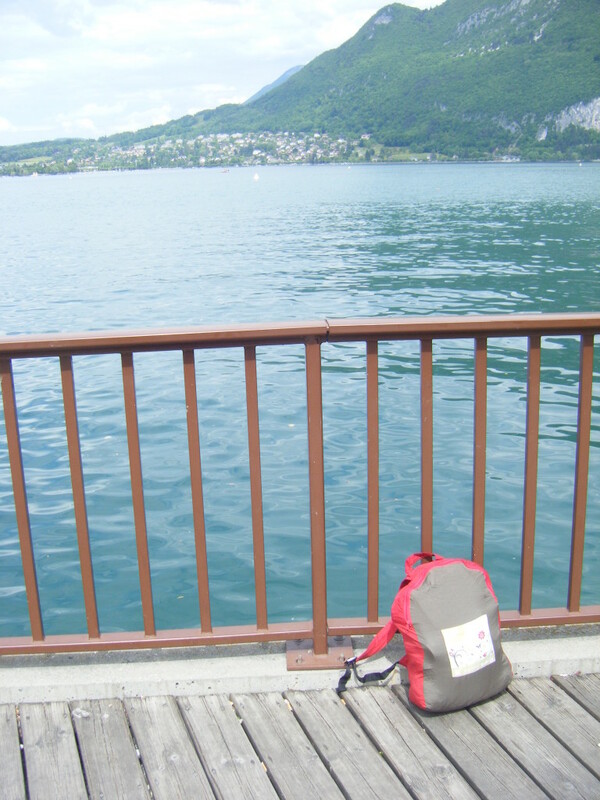 I headed back into Annecy to try and find some lunch. My goal with this trip was to spend as little money as possible, so dumpster diving was a key part of the plan. On the face of it, Annecy should have a great dumpster scene, since there are dozens of restaurants and bars around. However, in every alley that, in England, would contain the back exits and dumpsters, there were just.. more restaurants. This happened over and over again. Eventually I managed to find a baguette, but that was about the extent of my dumpster fortune for the whole trip. 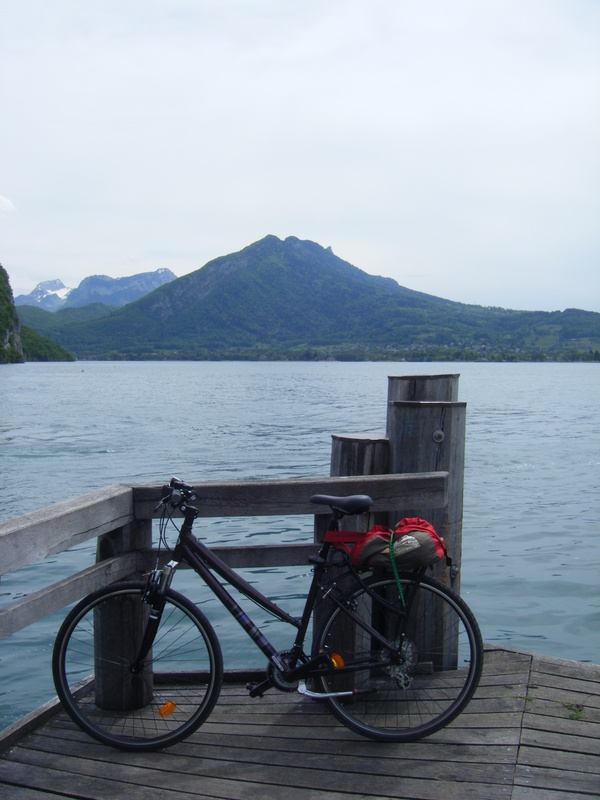 On my second day in Annecy, I borrowed Zoe’s bike, and cycled around the lake. It’s about 38km around, which I’d manage pretty easily on my bike, but on a heavy hybrid with flattish tyres, it was challenging. It yielded some amazing views, though. Zoe’s bike on a jetty. It was at this point that my plans changed a bit. Initially, my plan had been to spend two nights in Annecy and get back on the road, but I realised this was all wrong. When I set out from Calais, I thought, right. Next stop Annecy! But it just doesn’t work like that. It’s a horrible cliché, but it really is more about the journey than the destination; having come so far to Annecy, it would be foolish to just leave again immediately. In addition, the trip down had been so hard, and I was very much enjoying not having to worry about where I would sleep at nights. I decided at this point that I wouldn’t go to Vienna. This was a tough decision to make, since it meant I’d miss out on seeing Beverley, and since the trip had originally been conceived as Saltash to Vienna, but on reflection, it was the right decision. This seems like a good time to briefly introduce the Harlequin Theory of There Are No Wrong Decisions In Hitching, which is basically my realisation that because you don’t know about the rides you miss, however you get there is the right way to get there. I’ll revisit this in the next post. This was, truthfully, a difficult part of the trip for me. 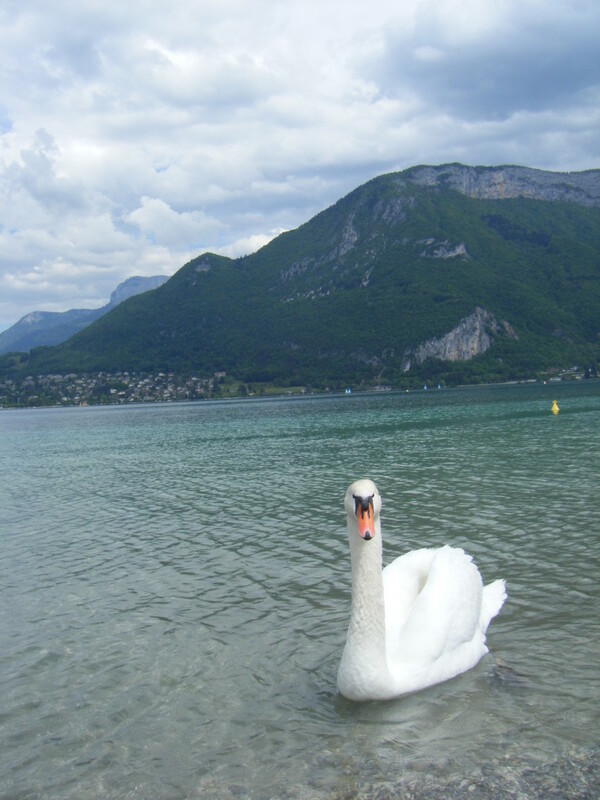 Each time I stayed in a place, I got very anxious about leaving it, and particularly at this point, since the journey down hadn’t been the smoothest, and Annecy was so lovely. I’m prone to this kind of anxiety anyway- every time I travel to London I get nervous the day before, even though I’ve done it over 50 times and never once had anything approaching a problem. Here it was especially difficult since I wasn’t sure where I’d go after Munich, and it seemed like it would be just a long trip back to the UK from there. I was in a slightly delicate state, and slightly overwhelmed, and in situations like that I can’t put it out of my mind and come back to it later; I’m completely useless for anything until I’ve worked it out in my own mind. It was then Zoe suggested that I contact Alex and Dineke, my cousin (Zoe’s brother) and his wife, in Amsterdam. I sent Dineke a message, apologising for being vague, since I had less than no idea when I’d get there, and she said I was welcome any time. I had a new destination! Sophie, my Bavarian friend with whom I would be staying in Munich, was away until Sunday evening, which meant I realistically couldn’t leave Annecy until Saturday, and, the outline of my plan made, that suited me fine. 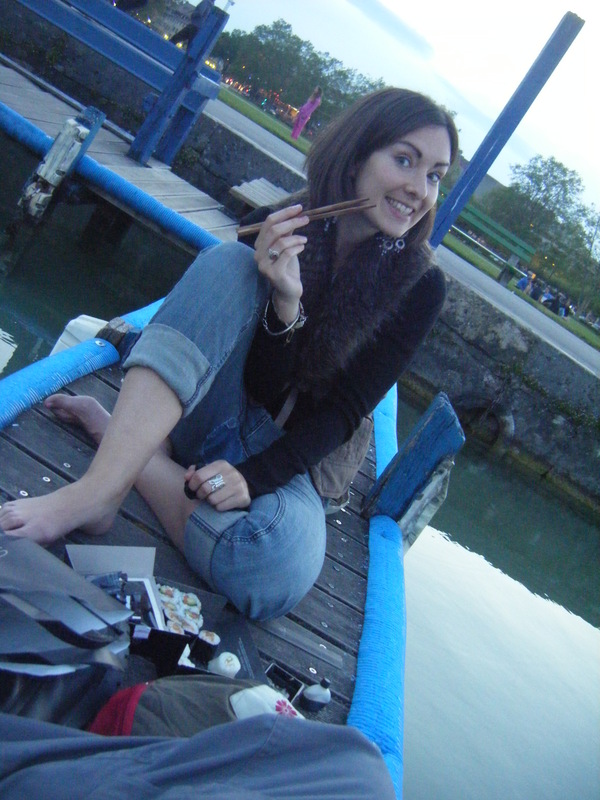 That evening, Zoe and I had sushi on a jetty on the Lake, and I was very glad to be staying in Annecy a little longer. Zoe eating sushi on the jetty. The next day, day 7 overall, I climbed an alp, or at least a part of one, and saw the Basilica that overlooks the town. Unfortunately, the only viewpoints on the hill looked out over the industrial parts of the area, rather than the pretty bits, but here’s a photo just in case you like that sort of thing. I could also see Zoe’s apartment from up there. I don’t know why you did this, France. I’d decided on the trip down that I needed a small bag of some kind, in addition to my rucksack, for keeping things that I wanted quick access to in- my diary, marker pens, mp3 player (amazingly important when I’m feeling run down), so for a few days I’d been looking around for something appropriate. 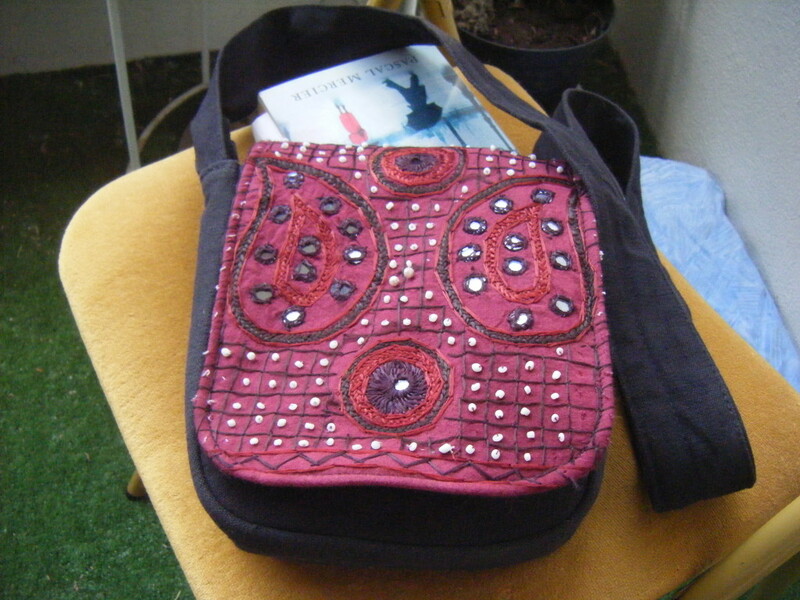 I found a bag, known henceforth as my hippy bag, in a hippy shop. I asked about bags and completed the transaction entirely in French (and some Spanish, because I’m horrible at differentiating between foreign languages), which I was quite proud about. My French had gone from basically zero to almost useful in the four days of hitching through a country which really doesn’t speak any English. That evening, it rained, proper European rain. It might rain often in the UK, but it’s never that hard. The French don’t mess about when it comes to rain. 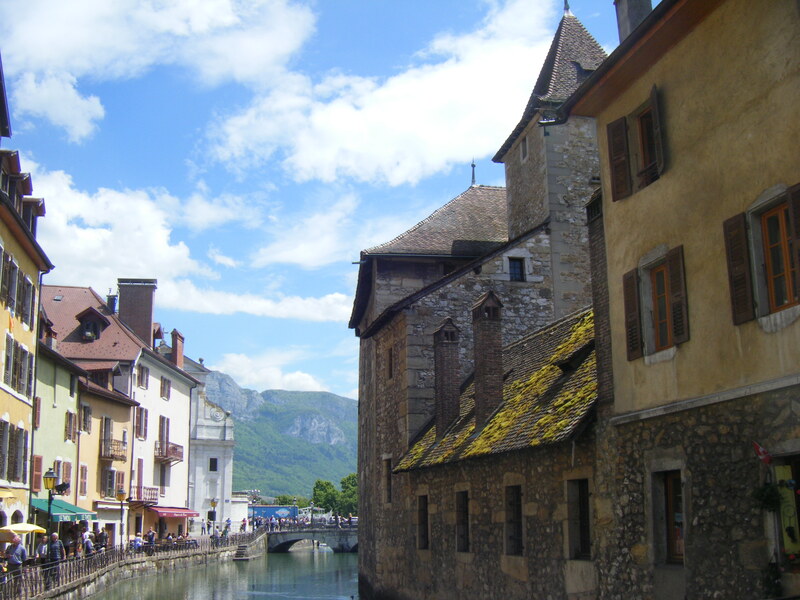 I decided to go for a swim, and walking through Annecy, with the river levels up and all the gutters spraying water into them from the rooftops was quite a sight. The beach, predictably, was deserted, but the water was no colder, and I swam for a good while, finally managing to get out of my depth in the surprisingly shallow lake. After that, I walked home, and then Zoe and I went to meet some of her friends at a winebar; it was nice to meet them (and I suppose they might end up reading this, so hello! ), and I also managed to table dive a bunch of bread and smoked salmon, which was a consolation after the dumpster disappointment. 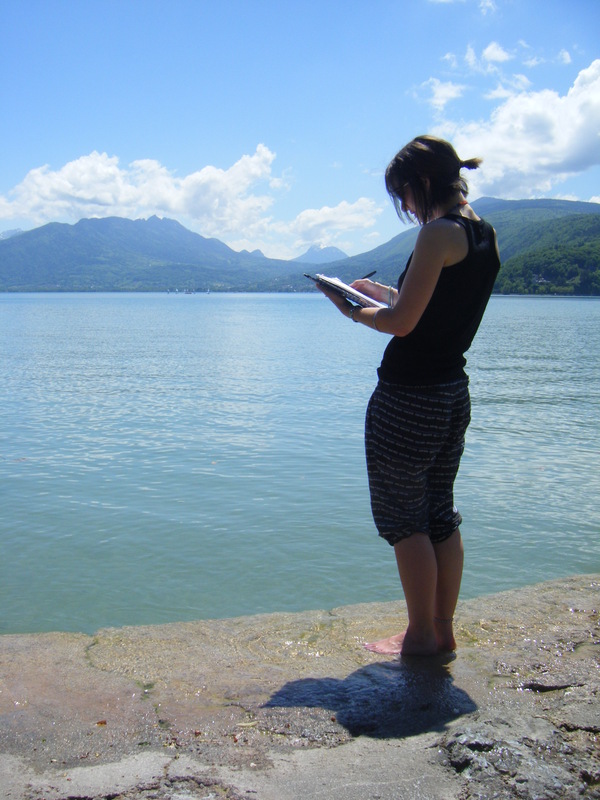 On the morning of my last day in Annecy, the weather was fine again, the hottest it had been, and we went out to the lake, since Zoe had some work to do that didn’t require a computer. I tried to work standing in a lake once, but the fabric got wet. I swam a lot, to some buoys about 300m offshore. The water was warmer on this side of the lake, the opposite side to where I’d swum before, and the view even more spectacular. Yeah.. not much I can say in a caption to this image, really. This entry was posted on Thursday, June 19th, 2014 at 6:31 pm	and is filed under travelogue. You can follow any responses to this entry through the RSS 2.0 feed. You can leave a response, or trackback from your own site.